The global economy is changing. Businesses are becoming more complex and interconnected. Organisations are generating and capturing trillions of bytes of information about their customers, suppliers and operations. And the technology, tools and platforms for analysing this data are evolving incredibly fast. This explosion of complexity, data, and technology is disrupting industries and creating new opportunities. But understanding the technology alone isn’t enough. The world’s leading companies need people who understand how management best practices are evolving to adjust to this new deeply complex, interconnected and data-driven world. People who can take data and transform it into a powerful strategic asset – people who deeply understand data, its potential and its limitations, who can frame complex data-driven business problems, analyse data with the right statistical techniques, employ the latest analytics tools and platforms, and communicate analytics results to business executives, partners and customers. The UCL Business Analytics MSc (with specialisation in Management Science) provides a rigorous, practical foundation in these critical skills and provides a platform for careers with global companies and high-growth businesses tackling world-scale problems. UCL’s Business Analytics master’s degree programme provides a rigorous, practical foundation in the key skills needed to unlock the value of data, and an in-depth understanding of how companies can use data to make decisions and improve business performance. It combines modules that explore how data and analytics are transforming key areas of business (decision-making, strategy, marketing, operations) with modules that provide students with the mathematical and computational foundations needed to make effective and intuitive use of the latest business analytics tools and platforms. Graduates from this London-based master’s programme will be highly employable in global companies and high growth and high tech businesses, finance and banking organisations and consulting firms. They will be equipped to influence strategy and decision-making, and be able to drive business performance by transforming data into a powerful strategic asset. During the year, students undertake six core modules, two optional modules and complete a Consulting Project/Dissertation. Core modules in Business Strategy and Analytics and Predictive Analytics in Terms 1 and 2 respectively, provide a foundation in how companies create value and competitive advantage in complex, innovation-intensive, data-driven environments. These modules are complemented by core modules in Mathematical Foundations for Business Analytics and Programming for Business Analytics, which ensure that students have the necessary mathematical and computational skills to be able to make effective use of the latest analytics tools. This provides a foundation in how companies create value and competitive advantage in complex, innovation-intensive, data-driven environments. It will introduce strategy frameworks for goal setting and performance evaluation, and examine the descriptive, explanatory and predictive nature of data. Ethics, privacy and security considerations will be discussed. Marketing Analytics addresses how to use data analytics to learn about and market to individual customers. This course examines the premise behind customer-centric marketing, helps you understand the customer lifecycle and customer profitability, and introduces analytical and statistical modeling of customer information. Underpinning the new analytics that are transforming key areas of business is foundational mathematics. This course will refresh your knowledge of algebra, statistics and calculus before moving onto econometrics with various Bayesian and regression models. It concludes with an introduction to the mathematical basis for supervised and unsupervised approached to machine learning. Computational models and concepts for business analytics need to be implemented with tools and technologies. The course will cover computational thinking, experimental methodology, preparing datasets and empirical methods for training, validation and testing models. Lab sessions will provide a general introduction to programming in Python and look at standard implementation of useful algorithms. Introductory use Matlab, R and Strata will also be covered. Predictive Analytics will build on the foundational courses in Term 1 to explore techniques from data mining, statistics, modelling and machine learning in greater detail. We will analyse current data to make predictions about future events across a variety industry use cases with support specific companies and practitioners. This course explores in greater depth how data and analytics can unlock value in these key business areas and build the insight and skills required to define and deliver practical, high-impact business analytics projects that improve business performance. Students take two optional modules from a selection of elective modules offered by the UCL School of Management. Students undertake a practical consulting project or an independent research-based project, which culminates in a dissertation of 12,000 words. The teaching team brings together people with experience of how companies are evolving their management practices in a complex, interconnected and data-driven world and how they are employing the latest business analytics platforms and tools to make decisions and improve business performance. The majority of classes are taught at Level 38, One Canada Square, Canary Wharf, which is UCL’s home within London’s global business district. Some optional modules will take place at the Bloomsbury campus, which will also be open to students. UCL School of Management has several existing relationships with analytics companies and software providers, including but not limited to: Matlab, SAP, Tableau and Stata. In addition, UCL School of Management is the first university partner of Quid, a San Francisco-based company that works with some of the world’s leading companies and management consulting firms to help them develop faster, deeper strategic insights. The Quid Intelligence Platform combines search, premium data and high-performance algorithms to create visualisations of markets, trends, and cultural phenomena. In 2013, Fast Company ranked Quid #2 in their list of The World’s Top 10 Most Innovative Companies in Big Data. Students on the MSc Business Analytics (with specialisation in Management Science) will be trained on the Quid Intelligence Platform and will have access to the platform during the year. Further industry partnerships are in development. UCL was the first English university to admit students regardless of race, class or religion, and the first to admit women students on equal terms with men. UCL degree programmes require our students to think critically and creatively, to tackle ambitious projects and to develop the leadership and entrepreneurial skills that will stand them in excellent stead for their future lives and careers. Our innovative new Business Analytics MSc programme embodies this approach to postgraduate study. We are looking for intellectually curious, self-motivated students who are passionate about business, technology and data. You will join an international cohort of students drawn from a wide variety of backgrounds. The minimum entrance requirements are an upper second-class Bachelor’s degree from a UK university or an overseas equivalent and a strong aptitude for quantitative analysis. Applicants are likely to have studied a range of degrees including business, engineering, computer science, economics, and psychology. Candidate with a least two years of professional, full-time work experience are preferred. We are aiming to prepare the next generation of “data native” managers who are able to take data and transform it into a powerful strategic asset. We would like to understand how the programme could help you achieve your career goals, and what skills will you will bring to the class. What your post-degree aspirations are. The personal statement is an opportunity to illustrate whether your reasons for applying to this programme match what the programme will deliver. Course fees are administered by the Student Fees Office. For more information on fees and financial support, please visit: UCL Prospective Student – Fees and Funding page. Application for scholarships and bursaries must be made either when confirming your place before the start of your studies. We are looking for intellectually curious, self-motivated students who are passionate about business, technology and data. Academic Profile: The minimum entrance requirements are an upper second-class Bachelor’s degree from a UK university or an overseas equivalent and a strong aptitude for quantitative analysis. Applicants are likely to have studied a range of degrees including business, engineering, computer science, economics, and psychology. Career Aspirations: Focused on helping global companies and high-growth businesses use business analytics to tackle world-scale problems. English Language Skills: Applicants whose first language is not English must be able to provide evidence that their spoken and written command of the English language is adequate. UCL’s preferred English language qualification is the International English Language Testing System (IELTS). A ‘Good Level’ is required for the Business Analytics: i.e. an overall grade of 7.0, with a minimum of 6.5 in each of the subtests. Application Process: Qualifications are assessed only once an application has been submitted. The equivalency of overseas qualifications cannot be assessed unless a full application with all supporting documentation such as degree transcripts, references, etc. has already been submitted to UCL. Applicants who meets the entry requirements and are suitable for the course may be invited for an online interview via WePow. For further information regarding the Business Analytics MSc (with specialisation in Management Science), please contact the Programme Administrator (Business Analytics MSc), UCL School of Management. UCL’s new Business Analytics MSc (with specialisation in Management Science) is unlike any other degree in the UK. It provides you with an opportunity to develop an in-depth understanding of how companies are transforming data into a powerful strategic asset and a rigorous foundation in the key skills needed to build a successful career in global businesses. 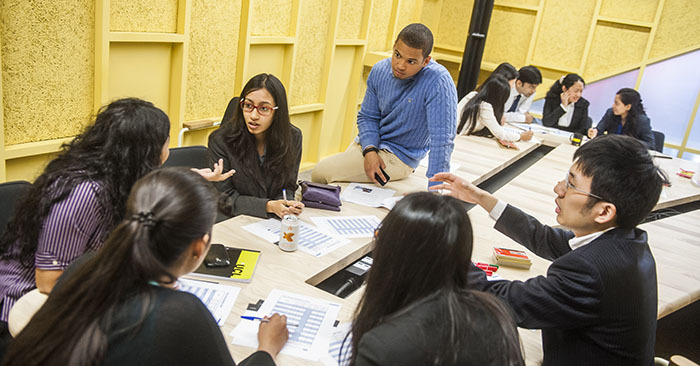 The programme is taught by the UCL School of Management, which is focused on creating disruptive research and entrepreneurial leaders for the complex, interconnected world of the future. The programme builds on the success of UCL’s innovative, interdisciplinary Management Science BSc/MSci, the first undergraduate management degree fully designed for a world of pervasive data. Enables students to develop the awareness, background, and skills necessary to become responsible citizens, employees, and leaders who can make a contribution to tackling some of the world’s most difficult social and economic problems. A knowledge of contemporary issues necessary to understand the impact of business analytics in a global and societal context. Our careers team work with students to enhance their employability, provide tailored individual careers support and facilitate connections with employers globally. Please visit our Careers page for further information. UCL is consistently ranked as one of the world’s very best universities and employers are keen to meet our students to discuss the opportunities they offer. In addition to the bespoke activities within the School of Management, you also have access to the central UCL Careers provision. Graduates from this new programme will be highly employable in global companies and high growth businesses, finance and banking organisations and consulting firms. They will be equipped to influence strategy and decision-making, and be able to drive business performance by transforming data into a powerful strategic asset.